We have once again secured The Albany pub as the venue for the traditional GH3 Burns Night hash bash on 21st January 2019. This event as always takes place after the hash run. Address: The Albany, 80 Sydenham Road, Guildford GU1 3SA. Please RSVP to Bugs Bunny j.newcombe07@outlook.com, and copy to Camping Gaz gazmorris@gmail.com ASAP (by Monday 14th January) as we need to give the chef notice of the numbers. Please make payment to GH3 bank account 09- 01- 28, 81495440 , reference “Burns” and confirm your booking by email, if you do not have online banking we will take payment in advance in cash on the 7th and 14th. The price remains at £10 per head for paid up GH3 members and their partners, and £15 for NON-members. Please don’t use GH3 facebook page as your reply as it will get lost in all the excitement to book your place. Event takes place after the run so meet at The Albany approx 8.45 pm for prompt 9 pm start. The meal will be: haggis, mashed potato and neeps, and gravy. If you are a vegetarian please make that clear on your email AND NOTE the vegetarian option will be veggie haggis only. By emailing Bugs Bunny & Camping Gaz to say that you would like to come, then you are agreeing to pay £10 (member) or £15 (non member) towards the cost of the meal. If you need to cancel we will do our best to fill your place in order to refund your money. 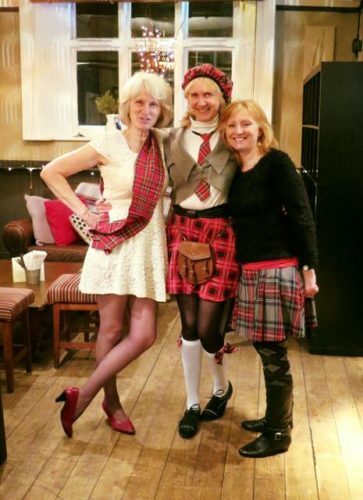 Hash Dress Optional: Anything Tartan! Hash Entertainment: Please make yourself known to us in advance. Maximum numbers 50 (which will mean we will be sitting cheek to cheek). All payments are required by 17th so that we can post a list of all confirmed payments on the 18th Jan.
A Taster of Robert Burns’ Poetry! And that’s a sonsie pintle. O leeze me on my Charlie lad! I’ll ne’er forget my Charlie! He nidg’t it in fu’ rarely. But it’s the double drivin.